Nowadays, in Buenos Aires, there are about 200 places where you can dance tango or enjoy a tango show. 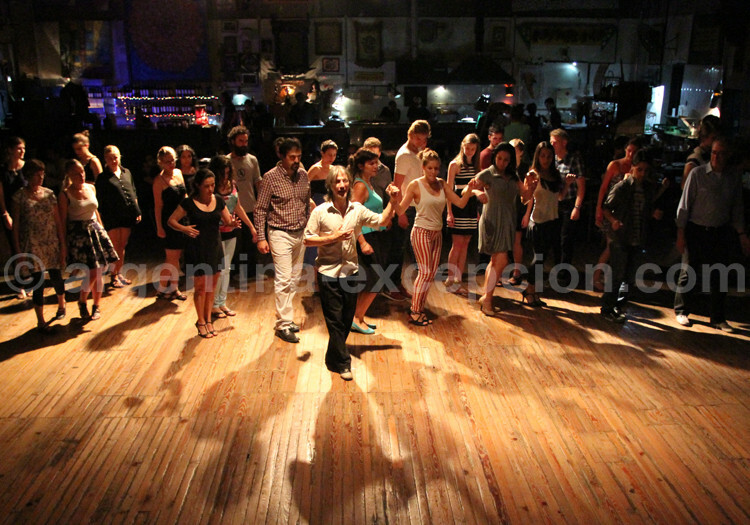 Nowadays, in Buenos Aires, there are about 200 places where you can dance tango or enjoy a tango show. The best repertoire was recorded again and young musicians of the new orchestras have come out in the market, such as Orquesta Típica Fernández Fierro. Many foreigners who stay for a while in Buenos Aires exclusively come here for tango and the local authorities have recognized that the city has a heritage that needs to be defended and highlighted. All year round, they organize several festivals and contests. In 1983, the successful show Tango Argentino, first in Paris and then in New York, intensified the passion. With dancers Juan Carlos Copes and María Nieves, the entire world re-discovered the passion for tango, they started to put up shows and open milongas and courses. The choreographies presented by Miguel Ángel Zotto and Milena Plebs with Tango x2 company gave this movement the final touch. Pruebas de este renacimiento son el Día Nacional del Tango, decretado el 11 de diciembre, día del nacimiento (en Toulouse) de Carlos Gardel y de Julio de Caro; y la creación, en 1991, de una universidad del tango. Una ley de 1996 ha declarado al tango “parte integrante del patrimonio cultural de la nación”. Evidence of this re-birth: National Day of Tango decreed on December 11th, birth date of Carlos Gardel (in Toulouse) and of Julio de Caro; and the creation of the University of Tango in 1991. A 1966 act decreed tango as “an integral part of the cultural heritage of the nation”. Buenos Aires has become a gigantic dance floor. – See our Tango glossary. – See the website El portal del tango. – Argentina Excepción suggests discovering the magic of tango in a week completely dedicated to this culture : Tango and folklore tour in Buenos Aires.